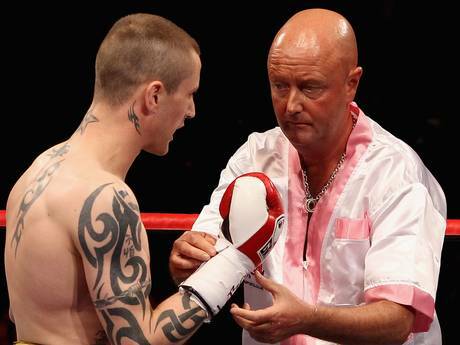 The boxing world has expressed its shock and sadness at the death of Dean Powell. Powell, who died aged 47 on Tuesday, had been in the sport for 25 years, as trainer, cornerman and matchmaker. His death is not believed to be suspicious. "All of us are deeply saddened and shocked by the loss of our very close friend and colleague, Dean Powell," read a statement from Frank Warren promotions, who he most recently worked for. “Dean was a valued and popular member of our team and within the sport of boxing. "Our thoughts and prayers are with his family and loved ones for their tragic loss." British boxers past and present, many of whom worked with Powell, have paid tribute. Sorry to hear the loss of Dean Powell. My thoughts and prayers go out to his family. He was close to team khan and trained me for 2 fights. You will be missed. Just found out the tragic news that Dean Powell sadly passed away. My thoughts are with his family.a great man & boxing will miss him. Shocked and saddened to hear about the death of Dean Powell. Boxing has lost a great guy. RIP my friend.